Welcome to the nursery at UCC Medfield! We believe children are a special gift from God and we want to provide the best love and care possible while they are staying in our nursery room. 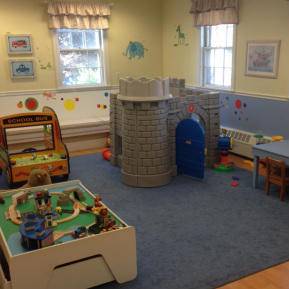 The Nursery room is open 15 minutes prior to the 10 am worship service for children under age 3. We are blessed to have Judy Lorantos as our staff caregiver and several high school students who volunteer every week so your children see familiar and loving faces each week! First time visitors will be asked to fill out a visitor form where you can leave some special instructions for the staff caregiver. Frequent attendees will be asked to fill out a registration form which will be kept on file for the school year. ​You are welcome to fill out the form before you visit us on a Sunday. All nursery parents will receive a Nursery Handbook which outlines all the policies and procedures at UCC to ensure a safe and caring nursery ministry. Parents will be given a silent pager at check-in which must be presented at pickup after the worship service. We hope the silent pagers are a comfort to parents so we can "call" you to the nursery if your child needs you. Please have your children’s belongings labeled. This includes diaper bag, bottles, drinking cups, pacifiers, blankets, etc. For the protection of your child and other children, parents are requested not to bring a child who appears to be ill.
Toys are wiped down at the end of each session.